Bunting® Magnetics Co. has added a newly redesigned RotoGrate Magnetic Separator to its Magnetic Separation product line. This product, which is ideal for products with poor flow characteristics, features a powerful motorized rotating grate magnet which processes material, such as cocoa, flour or starch, that would bridge traditional grate assemblies. 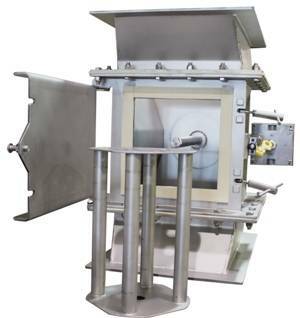 “The Bunting® RotoGrate will remove ferrous metals from powders and granular products with even the most difficult flow characteristics,” stated Rick Bigham, the Bunting Product Manager for Magnetic Separation Products. “We have streamlined the design elements. Also, we based the construction standards on essentially the same design, and with the same superior magnetic separation capabilities, as the Bunting® HF Drawer Filter. The RotoGrate is available in food grade and self cleaning options as well as our standard design. These options include the ability to order Ceramic, Alnico, or Rare Earth magnets to get the holding force right for your application. Bunting® can custom design anything to fit your installation requirements. Optional features include the ability to transition your product flow into the grate housing and removable tube assemblies for easy cleaning. Bunting® construction standards and magnetic assembly are industry-leading and we feature CE Certification and USDA acceptance on many of our Drawer Magnet product line.